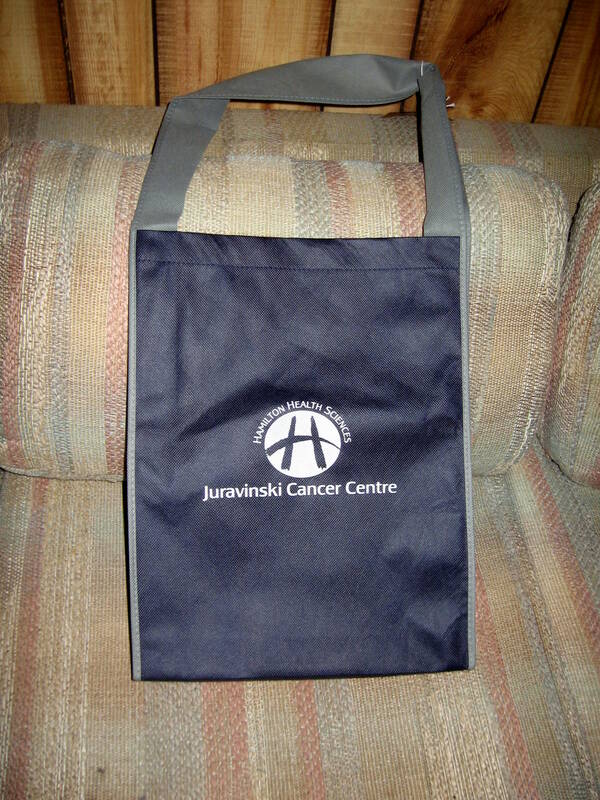 My JCC tote-bag. One souvenir I cold do without. Okay. I’m back from the latest trip to the clinic in Hamilton and here’s what’s what. On with the radiation therapy! (Oh joy) I head back down Thursday next (Dec. 9th for those of you keeping notes) and engage in a day full of fun and excitement. 1st up – a trip to the surgeon’s at 9:30 am. (or 9:50 am – can’t read my wife’s hand writing and neither can she. Will have to make a phone call on this one Monday) to make sure the charred flesh in my throat is healing nicely. That’s right, we want to be sure that my throat has fully recovered from the last atrocity inflicted upon it before we subject it to another one. 3rd in line – Lunch. Apparently it takes an hour and a half for the cast to harden; during which time I am invited to have lunch, take a walk, whatever, so long as I am back for the second act. 4th item – The man in the Plastic Mask – Act 2. Once the cast has hardened we return to the clinic where a CAT-scan of me in the mask will be taken. This will in turn be used to plot out the course of my radiation therapy sessions and pin-point EXACTLY where those aforementioned radioactive arrows will intersect with my anatomy. Then the mask will be marked with the indelible ink targets, instead of my face. That done I am set free to roam the earth until the actual radiation treatments begin about 2 weeks later (specifics to follow on Dec. 9th) I am told all will proceed without incident for the first few weeks of treatment, after which the side effects will kick in and I’ll wish my mother had never given my father his first kiss (or some other event that would have precluded my birth so as to avoid all this unpleasantness). Well, that’s the sum total of the information I have for now. This should be more than enough for the prayerful, the genuinely concerned, and the just plain curious until we write the next chapter. See you Dec 10th.